Price guide: £400 - £900 per week. Excellent value for money! Le Grenadier is a restored traditional four bedroom Perigourdian farmhouse with a high 'Perigourdine' roof and solid, stone walls that keep the interior cool during the summer, just 25 kilometres from Bergerac and sleeping 4 to 8 people. There are numerous period features including interior exposed stone walls and beams, and the property is furnished comfortably. We are able to reduce the price of renting the farmhouse for groups of 4 people or less in May, June and September. 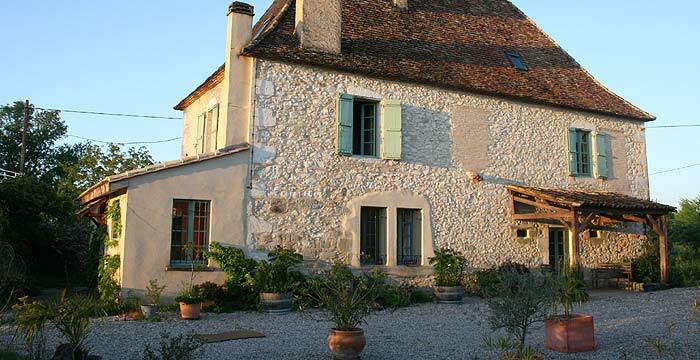 The farmhouse is one of two holiday rental properties at Fonguilleres. We also live on site, in a renovated barn across the courtyard from the holiday-rental properties. The first room downstairs in the property is the large lounge, with exposed stone walls and ceiling beams, comfortable seating, and a flatscreen TV (French only) and a DVD player and wide selection of DVD's. Also downstairs is a large kitchen / dining room with a fitted kitchen including oven, microwave and fridge, a 'farmhouse' table to seat eight people, and a cool terracotta tiled floor. You will also find a separate WC, a utility room with dishwasher, washing machine and a larger fridge-freezer, and a small 'reading room'. There is also a twin bedroom on the ground floor - hence the property can sleep 8 (6 upstairs), or cater for people with difficulty climbing stairs (but please note that this downstairs bedroom is quite small). Upstairs in the farmhouse there are three bedrooms (two with double beds and one with twin beds). There is also a family bathroom and one double bedroom has an en-suite shower room. The bedrooms are off a large open lobby area (originally the entrance hall of the house) with glazed double doors overlooking the garden and accessing the original stone staircase entry. The 'main' entrance to the property is now on the ground floor, but this entrance can also be used for direct access to the first floor. There is a large private garden, and a shady seating area with table and chairs for outdoor eating and living. The outdoor seating area faces south, and is not overlooked by, visible from or within hearing distance of the terrace for the other gite at the property. The garden contains plenty of space for playing frisbees or boules etc. The large swimming pool (12 metres * 6 metres), surrounded by terrace, a lawn area and gardens has views over open countryside and is always a very popular area during the summer. Use of the pool is shared with La Glycine and very occasional use by the owners.